Need to Illuminate Areas When Someone Moves? PowerBee offer super bright, energy saving led motion sensor lights - powered by Mains, Battery & Solar Power. Easy to install, effective low maintenance led lighting. Protect your property against unwanted visitors and brighten up your yard with garden security lights. PIR sensors will detect motion & turn the lights on for a set period of time. So you will immediately know if anyone approaches your home. Making these lights perfect for security and navigation around your garden. The rule of thumb is if you can get the solar panel in a good bright location then choose solar. If not then opt for battery power. Both work very well. Solar offers less maintenance & the energy used is free. Battery power is less dependant upon weather conditions. If you have external power then you could opt for mains PIR lighting. These floodlights offer huge energy savings compared to Halogen. They must be fitted by a qualified electrician. Mains power security lighting offers slightly more power. Solar and battery options are nearly as bright and you can install them yourself. Where to install security lighting? Firstly take a good look around your property, make a note of areas that can be used to enter the perimeter. Locate the light so that the PIR covers this area. Security lighting is the first line of defence for your home and acts as a excellent deterrent. You can also direct the PIR along paths and entrances. 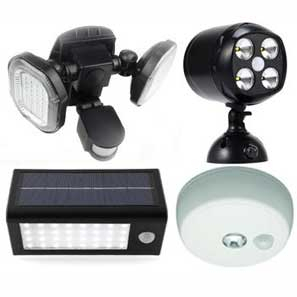 These outdoor Motion sensor lights are great for navigating your way around your garden. We also have a range of PIR lights that have dual functions. They operate on motion but also have a flood light setting that stays on all the time. Very handy for those late evening jobs in the garden.